Pizza in a box represents the most effective placement of a circle within a square since NASA attempted to encase the moon in a giant ice cube. Enjoy edible geometric feats with today’s Groupon: for $8, you get one large pizza with up to 10 toppings (up to a $20 value) atDomino’s Pizza, which has thousands of locations around the United States. * This Groupon is not valid in Alaska or Hawaii and cannot be used for orders placed over the phone or in stores; it expires on May 19. 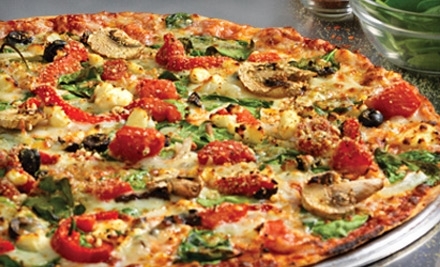 Domino’s has been decorating dough canvases with flavorful sauces, an assortment of cheeses, and high-quality toppings that range from classic to unconventional since 1960. Domino’s dough is tossed daily and stretched by human hands, not by clumsy catapults and model airplanes flying in opposite directions. Treat friends to a tasteful feast by checking the online menu and crafting a custom masterpizza with Domino’s wide range of ingredients. This Groupon is valid for online carryout ordering only, and Domino’s has a wacky system to redeem Groupons; after entering an email address on the special Groupon page, customers will be sent a unique website at which to redeem. Once a pizza is ordered, track it using Domino’s Pizza Tracker, saving you the trouble of hiring yet another private investigator to shadow your food. *Although individual locations sometimes feature discounted prices online, this Groupon, when used for its full $20 value, still offers the best deal available for a large pizza from Domino’s. Limit 3 per person. Limit 1 per order.Must order online. Must provide email address upon redemption to receive unique PIN and URL; you will not be added to Domino’s mailing list. Carryout only. Valid at all US locations except those in Alaska or Hawaii. Not valid with other offers. Tax not included. LOVE SUSHI OR HIBATCHI? GET THE DEAL OF THE DAY ON http://www.purchaseparty.com. Yum! KOBE in Plymouth, takes everything you like about sushi and Hibatchi up a level! If you like Benihana or Ichiban, you’ll LOVE KOBE! If you’ve never been to an ‘interactive’ hibatchi meal, there’s nothing like it! 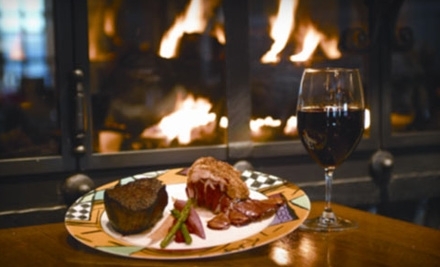 Besides the fire, the food in the air, the masterful knifework by well trained hibatchi chefs, and the exciting show….at the end, is the most incredible steak, chicken or seafood entrees you’ve possibly ever had! HIbatchi “magic” is fun for couples, and fabulous for families! Our favorites are the fillet mignon and shrimp combo at the grill, and the Plymouth roll (pictured) or any of the sushi at the sushi bar. The hot stone beef you get to prepare yourself is really fun too! You’ll see why everyone celebrates their birthdays at Kobe! ps: the restaurant is just beautiful, with easy parking! Best Place to celebrate a birthday! 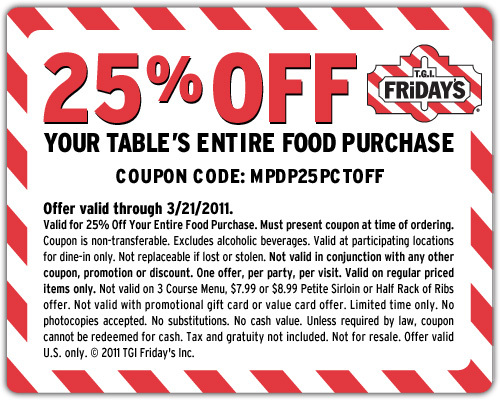 Not valid for Happy Hour, or with other offers. At the end of each week we round-up all the restaurant coupons and deals we can find and share them in one central spot (right here!). This week we’ve enhanced the list to include coupons and offers we have previously mentioned, but that are still available. Our intent is to make this a useful resource for you as you think about heading out for lunch or dinner over the weekend. Also, consider buying a coupon from Restaurant.com where everything is 60% off this weekend when you use the code FORK; code expires on Monday, January 17. Your turn: How else could we improve this list of dining deals and coupons? Chili’s. Receive a free appetizer at a Chili’s restaurant near you when you purchase one or more entrees and present this printable coupon. Limit 1 per table. Offer not valid with any other discounts or special offers. Coupon expires 1/27. Chuck E. Cheese. Use these printable coupons to get a large 1-topping pizza & 75 game tokens for $25 or get 2 regular soft drinks & 20 game tokens for $6 or 3 regular soft drinks & 30 game tokens for $9 with pizza purchase. Coupons expire 3/2. Find a Chuck E. Cheese location near you. Old Country Buffet. Sign up for Old Country Buffet’s eClub to receive a coupon via email for Buy 1 Buffet Meal, Get 1 Free. You should receive your coupon within 24 hours. Find an Old Country Buffet near you. Note: You will have to confirm your email address by clicking on the link provided in a confirmation email before you will receive your coupon. Quiznos. Quiznos has several printable coupons available right now. Use the printable coupons found here to receive a free cup of soup with purchase of an entrée or get a small sub/half Toasty Favorite, a cup of soup and a regular fountain drink for $4.99. Coupons expire 1/17. Use this printable coupon to get $1/1 sub, $2/2 subs or $3/3 subs through 1/20. Offer excludes Toasty Torpedoes and Toasty Bullets. Use the printable coupon found here to receive a free chip and regular fountain drink when you buy any regular sub, large sub or regular chopped salad. Offer excludes Toasty Torpedoes and Toasty Bullets and expires 1/25. Find a Quiznos near you. Wendy’s. Wendy’s is offering another printable coupon for free Natural-Cut Fries with Sea Salt on their Facebook page. You will need to allow an application to access the coupon. Find a Wendy’s near you. **I suggest printing this coupon now as I am sure they have a limited number of prints and am unsure if this coupon will be valid closer to the date its valid on. Dickey’s Barbeque Pit. Every Monday through 1/31, you can get a Pulled Pork Sandwich for only $1. No coupon necessary. Limit 2 per customer. Find a Dickey’s restaurant near you. IHOP. IHOP is offering All You Can Eat Pancakes for only $4.99 for a limited time at participating locations. No coupon necessary. Find an IHOP restaurant near you. Olive Garden. Receive a free appetizer or dessert (up to $9 value) at an Olive Garden restaurant near you when you purchase two dinner entrees and present this printable coupon. Dine-in only. Coupon valid through 1/31. Only 1 coupon per visit. Waffle House. Use this printable coupon to get a free waffle at a Waffle House restaurant near you. 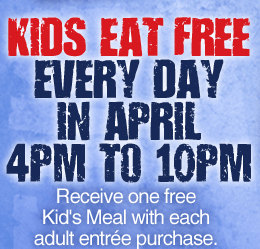 Coupon valid through 3/1. Limit 1 coupon per visit. 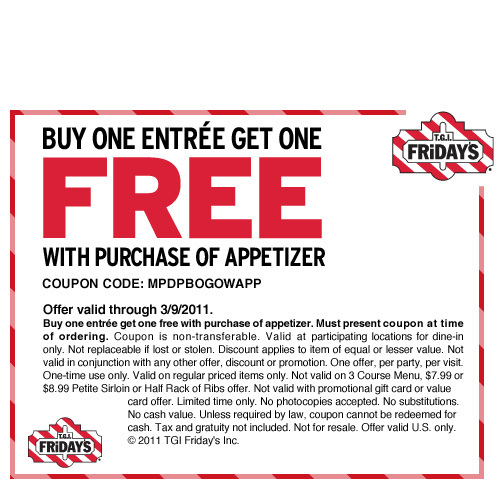 Also available isprintable coupon good for a free single order of hashbrowns. Offer expires 1/15.